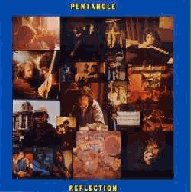 The Pentangle were always great at creating musical fusions, and on this album, they once again come through. The opening song, "Wedding Dress," is a fabulous meeting of Celtic, country, and, believe it or not, funk. It's one of the few songs of theirs that actually rocks. The rest of the record is classic Pentangle, with Bert Jansch's and John Renbourne's acoustic guitars intermingling so well that it would make even Neil Young and Stephen Stills a little envious. Jacqui McShee, as usual, has some exquisite vocal moments, namely the previously mentioned "Wedding Dress" and an excellent reading of "Will the Circle Be Unbroken." This track shows how the group was further exploring new musical ground, this time with traditional American folk/gospel. The group's rhythm section of Danny Thompson (upright bass/cello) and Terry Cox (percussion) - easily one of the most inventive on the planet - shines on every cut, creating solid ground for Renbourne, McShee, and Jansch to do their high-wire act on vocals and guitar. One of their finest all-around albums.